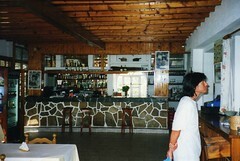 Daughter Connie reports she has been involved in the community theatre in her town. She says she played Lazarus and where she was dragged across the stage and then miraculously arose from the dead. I like to think I inspired her interest in the theatre. In the 1960s, when I was a Scout Leader, I had my girls (including Connie) work on their Drama badge. This meant taking my troop (with help from other parents) to many productions, including plays and symphonies. As luck would have it, one of my parents was a member of the US Air Force Band and got tickets for our troop to attend the annual Christmas concert held at the DAR Hall. Another parent was an actor with a local community theatre group who landed bit parts in various films made here in DC (like No Way Out with Kevin Costner.) We attended several productions including musicals by her group which operated out of Fort Belvoire. In the 1970s, I held season tickets to every theatre that mattered in DC at the time including the Hartke Theatre at Catholic U where Alan Alda got his start, as well as several commercial venues including the National Theatre and the Kennedy Center. To complement my theater-going experiences, I took several continuing education courses in play writing and theater, offered at Georgetown U. In one course we focused on the new women playwrights of the time like the author of The Heidi Chronicles. Eventually, I was able to see these plays in a theater production and/or film. I was a serious theater goer. In the 1980s, after I married David I began traveling to NYC to see various productions. When I was on one of my many business trips to NYC, I always took in a play or two. One evening I attended the theater in NYC wearing athletic shoes (I had been walking all day and went straight to the theater), a fact not overlooked by the members of the “dressed in their best evening attire for a night on the town” crowd. When Cats came to DC, we could not get tickets, and David said, to heck with this..he got tickets for the NYC production with the original cast, and we flew there for the weekend. Those were the days. When I went to work for the government in the 1990s, I discovered my boss was a big opera fan (he had an Aida poster on his door). I had been buying season tickets for the opera (held at the Kennedy Center) since the 1980s, so we had much in common. Later in the decade, I traveled to Spain, and while dining in Seville on the best calamari I have ever eaten, my kids and I heard Carmen playing from a nearby factory. In the 2000s, when we visited Aunt Marge in Sheboygan, she always had tickets to one of the local theaters for one play or another. One year it was Driving Miss Daisy, another year was Trip to Bountiful, another year an older actor from the Carol Burnett Show doing a standup routine who entertained us badly. Marge’s neighbor, Susie, a retired producer from NYC always went along and offered her criticisms of these “second-rate” productions. Somewhere along the line, David lost interest in the theater and opera and we fell off the wagon, so to speak. When he fell asleep during The Bartered Bride staged at the Kennedy Center Opera House, I decided enough was enough. Those tickets were too pricy for napping. After that, I cancelled all the theater tickets, and I haven’t been to a play or any musical production in years although I have watched Les Miserables on TV a dozen times. We eventually lost interest in films so we don’t go to any kind of theater today. Occasionally, I will rent a film produced with an older audience in mind, like Quartet. But the truth is, the DVD of this film has been lying on a speaker for months, as yet unwatched. I was interested in this film because Pauline Collins is in it. Once upon a time, I traveled to NYC to see her live on stage in Shirley Valentine. That was so long ago, and the heady days of the 1980s and 1990s when feminist stories were at a peak. But that was then. Will I ever feel that interest again? This entry was posted in Contemplation, Film and Television, Memories, Retirement Living, Women, Writing by SchmidleysScribblins. Bookmark the permalink. Theater tickets are really expensive. I think the last production we saw was Wicked… many, many years ago in Chicago. Before that it was Les Miserables which was my favorite. One of these days, perhaps we’ll splurge again. We saw “Quartet” — not to be confused with “The Late Quartet” starring Philip Seymour Hoffman, Christopher Walken and Catherine Keener. They were both good, and both passed the ultimate test — they did NOT put me to sleep! I didn’t know about the other Quartet, but love the actors, so I will check it out. This has been a brilliant year for me, with seven theatre visits, amateur and professional. I love it! Enjoy it while you are young. We usually get tickets for the big musicals when they come to Melbourne – stay overnight in the city rather than drive home late. Not much at the cinema at the moment to tempt us – we did see Quartet which was fun. Spot the actor with explanations in the credits at the end. Do watch it, I think you will enjoy it – for me the draw card was Maggie Smith. Thanks Cathy, I will look at it eventually. Our daughter-in-law is in a small production of Fiddler on the Roof, her role is one of the sisters. We haven’t been to the theatre in years but will be seeing her perform before the production ends. Love those amateur productions. We saw David’s granddaughter in the Sound of Music. She played one of the Von Trappe children..Greta I think. Too bad you don’t see live theater anymore. David and I have reserved Saturdays for Hawaii football games and Sundays for the opera or symphony. Our weekends are booked solid until the end of the year. It’s too bad we don’t hit the beach anymore, though. Too much of our lives is spent indoors. However, when my hairdresser told me “You have such beautiful skin,” I told her “It’s because I don’t go to the beach.” Win some, lose some. Lol. I’ve seen enough to last a lifetime. I suppose it’s burnout, but David’s lack of interest does not inspire me to waste money. 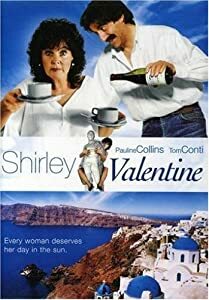 I remember Shirley Valentine. I loved her sassiness. One of the best movies I’ve ever seen. I miss live theater too — I haven’t had time to see much of it. One of the best theaters that I always enjoyed visiting was Wayside Theater in Middletown. Bit of a drive (!) but always worth it. Is that Middletown NJ by any chance? I got married there once upon a time. Middletown is in Virginia. Shenandoah Valley. Yes, glad to see the books and other goodies on you blog again. Yes, too, I shall take pictures of my living room today. It sure made me miserable when the drawing board was in the wrong place. We actually stopped using the room. LOL Yes, theater. I was busy with a small theater on base in the 1960’s. I was never caught up with the magic of it all. I always wanted to know what was happening back stage from then on. The worst production I’ve ever seen was “The Love of Three Oranges.” The best, perhaps “Once upon a Mattress.” The Carol Burnett goodie. We did have symphony tickets for years while Duck was alive. We all liked it, but after his death, we haven’t been back. Local theater can be fun or a disaster. funny how something that was once so important becomes less so.